Not Again, Red Riding Hood! is available in English with Albanian, Arabic, Bengali, Chinese Traditional, Czech, Farsi, French, German, Gujarati, Hindi, Italian, Panjabi, Portuguese, Russian, Serbo-Croatian, Somali, Spanish, Tamil, Turkish, Urdu, and Vietnamese. 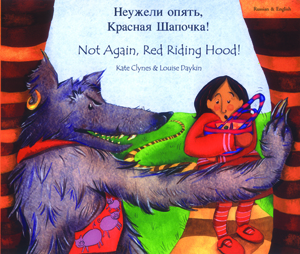 A multilingual audio CD of Not Again, Red Riding Hood! Is also available (note: book and CD are sold separately). It is narrated in English by the author herself, followed by narrations of the story in all of the following languages: Albanian, Bengali, Chinese (Cantonese), Czech, French, Portuguese, Somali, Turkish and Urdu.